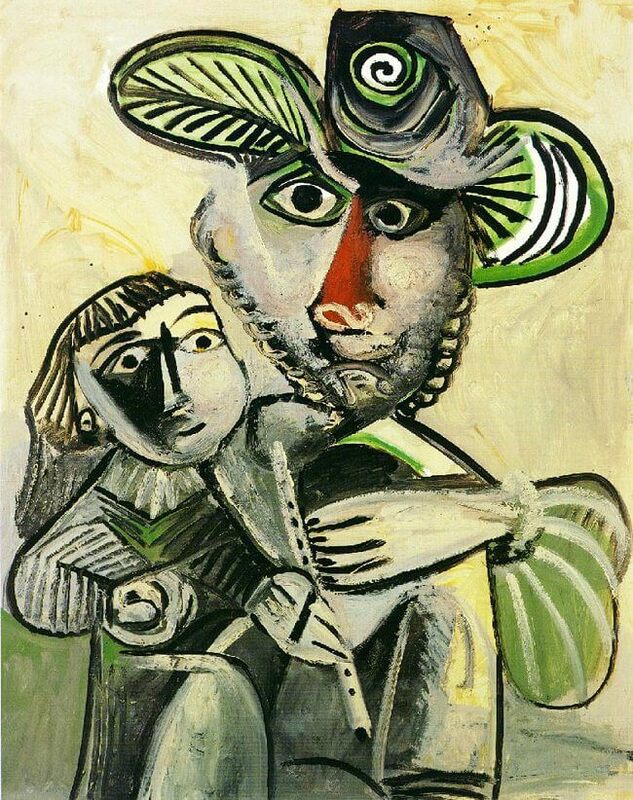 In October 1971 Picasso celebrated his ninetieth birthday. Despite the inevitable frailties brought on by old age he remained active, producing a large number of drawings and oil paintings. Among these late works is Fatherhood, an enigmatic painting that introduces a reference back to childhood. Here a bearded figure, dressed in the costume of a cavalier, stands beside a young child. In his right hand he carries a flute, although the musical instrument is held more like a pen or brush. It seems for from clear here what the relationship between the older man and the younger child might be. However, the child notably leans forward towards the instrument, thus suggesting the process of passing skill on from one generation to the next. Is Picasso, towards the end of his life, recalling the artistic education he received at the hands of his father? Picasso continued to produce both drawings and paintings right up to his final days. He died in April 1973, aged 91, and was buried in the grounds of the Chateau at Vauvenargues, near the foot of Monte Sainte-Victoire. Copyright © 2009-Present www.PabloPicasso.org. All Rights Reserved.